This is a dish from one of my favorite chefs and one of my favorite cookbooks of all time. It is clams and sausage in parsley sauce over linguine by Anna Pump. I’ve written about Anna Pump before. Anna has never had a television show that I know of and I don’t think her cookbooks have made her millions of dollars, but her and her store in the Hamptons, ‘Loaves and Fishes’, have inspired so many people to make great food using simple and fresh ingredients. She has inspired people like Ina Garten and Martha Stewart, who both have taken her philosophies to the masses. 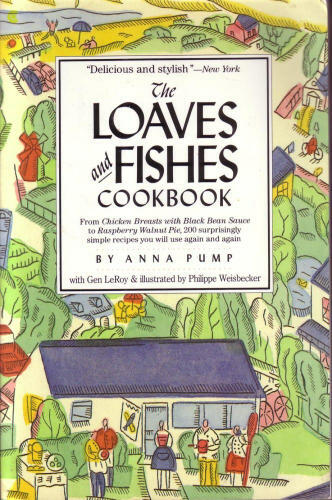 In 1985, she wrote ‘The Loaves and Fishes Cookbook’ and I have loved using it since the day I bought it. There are a lot of cookbooks out there, but Anna Pump’s cookbook is one where you can feel how much she loves food and cooking. A lot of cookbooks are printed to make the author lots of money. Anna’s is not that type of cookbook. You can read it and tell that she has a deep and true love for the art of food. She is the rare type where the mission is the food and whatever comes after that is secondary. If she published or not, if she became famous or not, it doesn’t matter. The craft comes first and this craft is the art of making great food. The only other chef I can think of with this same philosophy is Julia Child. 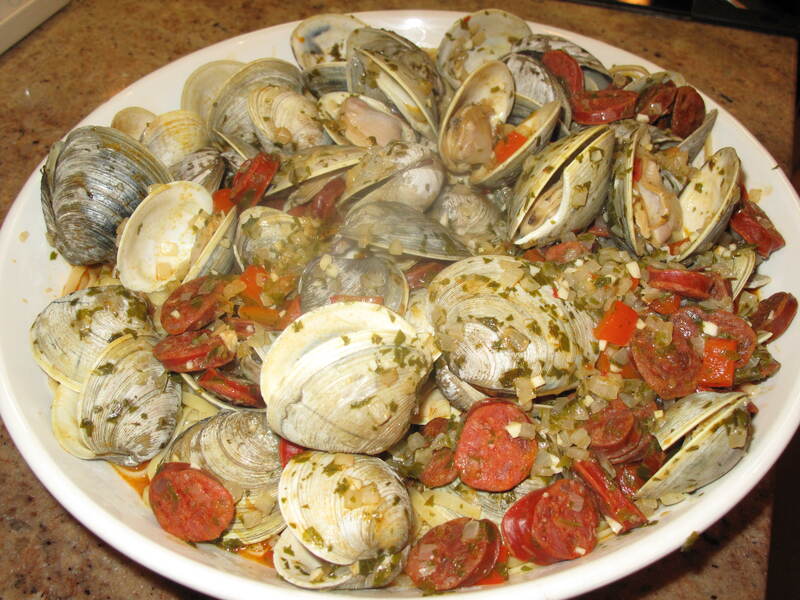 I love the idea of mixing clams with sausage. This recipe is somewhere between a paella and a pasta dish with seafood. The sauce starts out very pale and reddens up after the addition of the chorizo sausage. The sausage also adds a little heat to the recipe which is another thing I like. Don’t get me wrong…this is not over-the-top hot, but just enough kick to make it interesting. The parsley is also a nice addition. I always use Italian flat-leaf parsley because I think it is less bitter than the curly variety. The recipe below is modified from the original. I use less clams, onions, red pepper and parsley than the original. I just think the original will make too much food. 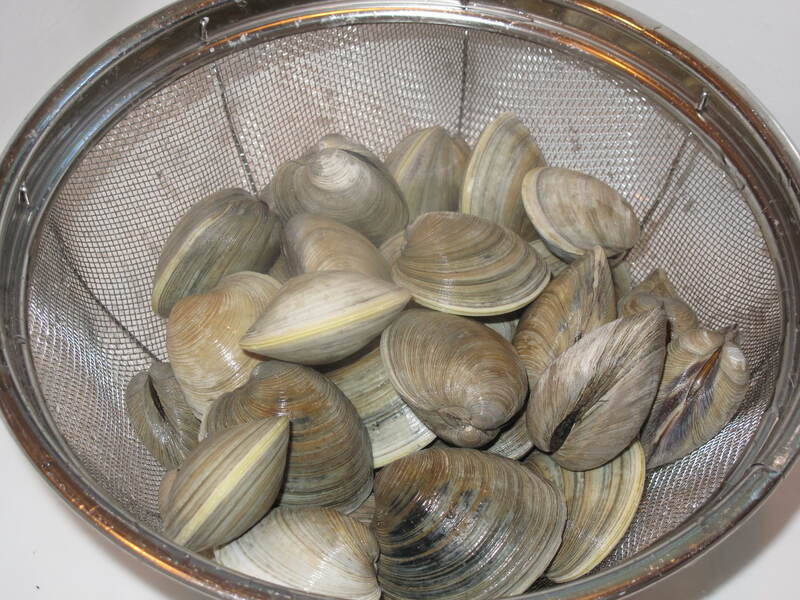 For example, the original says to use 6 dozen littleneck clams…that seems like a lot to me. 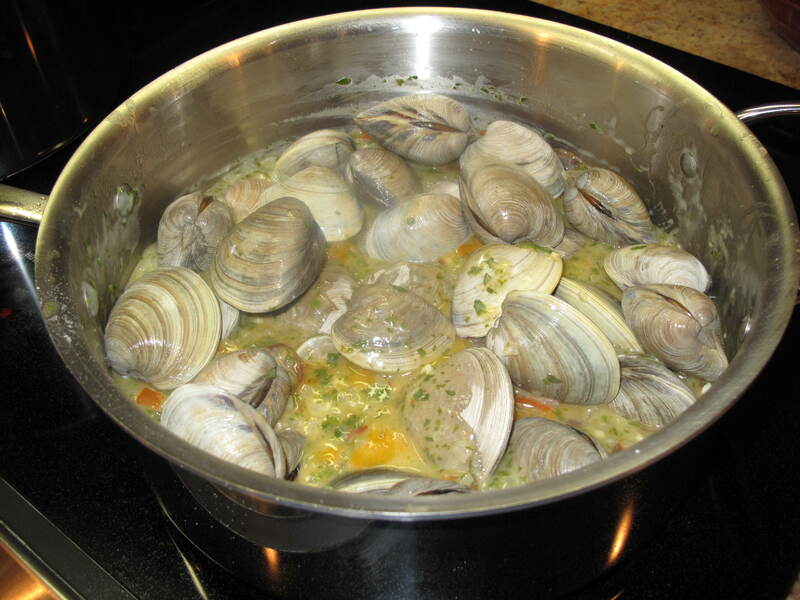 Try making this recipe….it’s like a delicious beach clambake in your own dining room. Scrub the clams and set aside. Heat the oil in a large saute pan. Saute the onion, garlic and red peppers for 5 minutes over low heat. Sprinkle the flour over the vegetables. Stir to mix well. 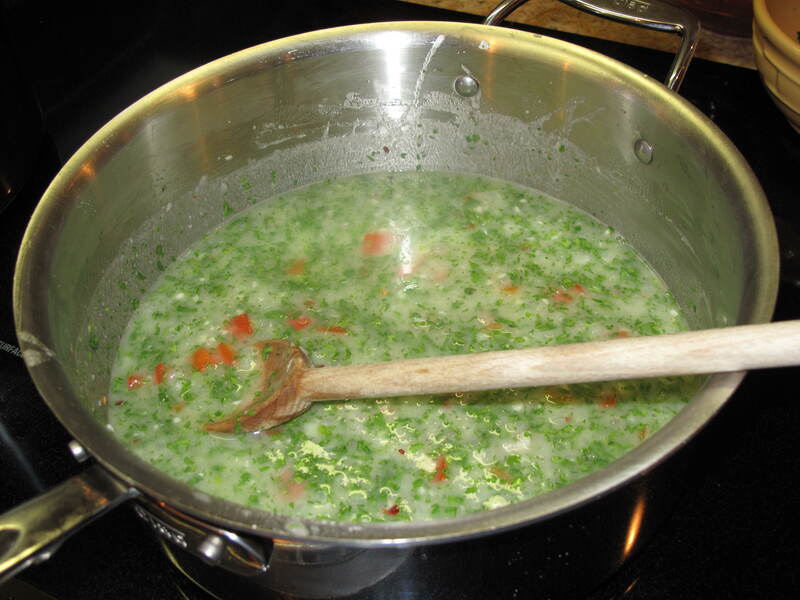 Add the clam juice, wine, parsley and hot red pepper flakes. Stirring constantly, bring the mixture to a boil. Simmer for 5 minutes. Add the sausage and the clams. Cover and bring to a boil. Simmer just until the clams open. This will take no more than 5 to 10 minutes. Place cooked linguine in a large pasta bowl and empty clams and sauce over the top. Serve immediately. This meal is easy because it doesn’t require a lot of side dishes to round it out. We ate it with just a green salad on the side. How easy is that? This dish has so much flavor. I was so happy how it turned out, but then again, Anna Pump’s recipes never seem to disappoint me. Give this dish a try, and if you like it, go find some more Anna Pump recipes. She is a really talented chef and worthy of the recognition. What favorite chefs do you go back to time and time again that you would like to tell us about on Acorns On Glen? This entry was posted in Food and tagged Acorns, Blog, Cooking, Family, Food, Fun, Life, Lifestyle, Love, Main Dish, My Life, Photos, Recipes, Summer, Thoughts. Bookmark the permalink. She sounds like my kind of cook, glad to learn of her. I’m with you on the parsley, has to be flat leaf. This looks amazing. Clams are one of my favorites. Hi. It’s a great cookbook. Not like the ones today by any means, but a great old-time cookbook to have in your collection. If you like clams, this was tasty. It’s funny that I didn’t remember her name but remember the cover of her book, I’m going to have to look through the books I have stored. Thank you for posting the recipe…it sounds so flavorful. Hi Karen. Thanks for your comment. If you like clams, this is a winner. Kudos for naming a cookbook you like! I wish more food bloggers did that. I confess to have never heard of this book so even better. 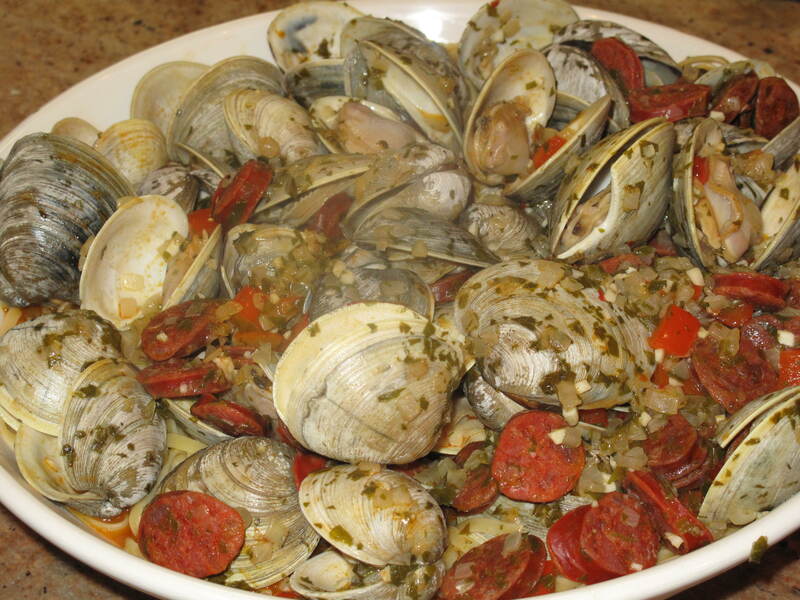 Clams and sausage is definitely a great combo. This looks fantastic to me. Thanks for the comment. Hope you look up some Anna Pump recipes. Like her a lot. The clams were great. Come back and visit soon. this sounds lovely, we eat a similar dish in portugal and its divine!!! Hi tinkerbelle86. Welcome to Acorns On Glen. Glad you liked the recipe. Would love to travel to Portugal one day. I hear it is wonderful. Take care and come back and visit soon.